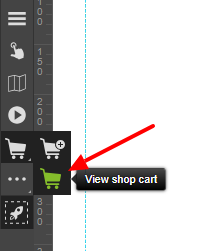 Element "View shop cart" will not only allow customers to display products added to shop cart, but also fill the order form and make an order in your store. In order to add this button to a website, select its icon in the toolbar on the right side of the builder. Add to shop cart button has exactly the same features as a regular button. If you still don't know how to edit it, read an article on button element in WebWave.